It would be just one more casual accident if I wasn’t on my way to interview Cristi Puiu, one of the more controversial, yet praised auteurs of the so-called Romanian New Wave. With an injured arm and a dirty cardigan, I straightened up and followed my way to Mandragora, Puiu’s production house, where I was supposed to meet the filmmaker. Soon I would confirm what I defined as a love-it or hate-it character, based on what people who had met him beforehand had told me. Throughout our talk, I tried to sense the course of his career in filmmaking. As my arm would not stop bothering me, such was the pain, my concentration was however feeble. I could not stop thinking about his most well-known film, 2005’s The Death of Mr. Lăzărescu. I had never stepped into a public hospital before and the examples shown in the film made me not look forward to the possibility of doing that soon. 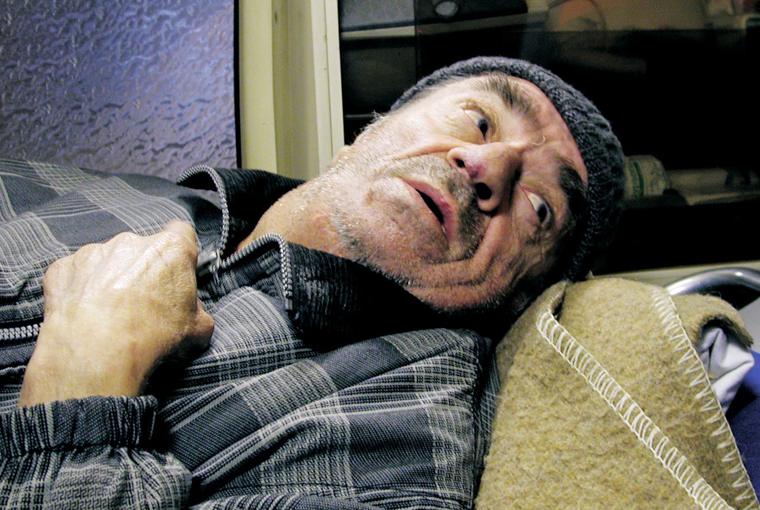 The Death of Mr. Lăzărescu tells the journey of Dante Remus Lăzărescu (Ion Fiscutaeanu), an ill old man who has to face a bleak “tour” through Romanian public health care system. This is a nightmarish journey, of which we already know the end – its explicit title tells it all: in fact this is the story of the death of a man. Lăzărescu is an old man with evident issues with alcohol – at least that’s what most people around him, from the neighbours to the doctors, point out. After waiting for ages for the ambulance he called, it finally arrives. His only company is the paramedic Mioara (Luminita Gheorgiu), also the only one to show some pity for the man. Since the hospitals he has been taken to do not seem apt to take him in, due to different – and most of the times quasi-absurd – reasons, we watch Lăzărescu’s health state quickly deteriorate. When he’s finally accepted in a hospital, we also realize that his death, if not literally shown in the film, is close. The film relies on long shots, simple décors, strong yet matter of fact dialogues. 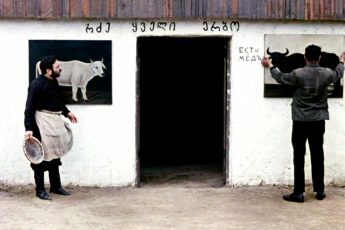 The colour palette ranges from yellowish to almost black, with a predominance of shades of green, that enhances the impression of illness – something is wrong with Lăzărescu’s health, but also with the relation between him and people around him – a relation in which hostility and, most of all, indifference are the prominent aspects. It is a story about the lack of communication – Lăzărescu and Mioara desperately and unsuccessfully try to communicate with the hospitals’ staff – and this failure ultimately leads to the old man’s death. Whether he indeed inaugurated a tendency or not, The Death of Mr Lăzărescu was the first Romanian film made by a new filmmaker to have a really broad positive reaction abroad, winning the best film award in the Un Certain Regard section of Cannes film festival in 2005. This prize started a trend that culminated with the Palm d’Or for Mungiu’s 4 Months, 3 Weeks, 2 Days. From then on, film critics started talking about a certain Romanian New Wave. In fact, the real start of this “wave” is another film by Puiu, his début, Stuff and Dough. 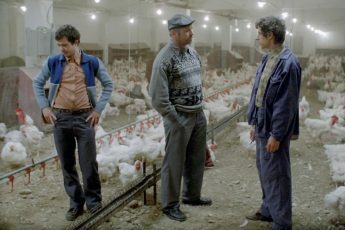 This film, together with Mungiu’s first feature Occident (2002) already brought to light some of those aesthetic choices mentioned above, but, most of all, were Romanian productions made by new filmmakers, with limited funding and a lot of creativity. 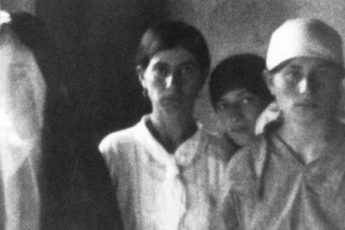 We can say, then, that Lăzărescu’s positive reception legitimated new Romanian cinema as worth of critical admiration. It was the affirmation of the cultural value of the cinema made in that country. Therefore, it became fair to film lovers to talk about yet another “New Wave” in film. If Lăzărescu, the character, could not break the indifference of those around him, dying as a consequence, Lăzărescu, the film, broke the indifference about Romanian cinema in the international sphere, showing it was still alive and well, thanks. PS. : As for my arm; I had a twisted elbow and had some nice plaster put on it in Bucharest’s University hospital – that left me a better impression than the one left by its’ appearance in the film.